Are you looking to have your gutter clean, repaired, replaced, or installed? This guide will walk you through all the ins and outs of gutters. It’ll tell you what you can expect to pay on a gutter job as well as how you should screen gutter companies. If you need any help with your gutters, give Roofing Roger a call at 910-302-5262. 6.1 How long do gutters last? 6.2 Do you recommend a gutter cleaning tool? Gutters are tracks along the edge of a home’s roof. The purpose of gutters is to move water away from the building’s foundation to prevent water damage. A proper gutter system is necessary for a house to last a long time. A compromised gutter system, if left un-repaired, can lead to expensive damages such as black mold. The average homeowner in the US spent $897 with a 25th and 75th percentile between $552 and $1,247. This means that you’re most likely to spend about $897 on gutters and, in addition to that, you have a 50% chance of spending anywhere between $552 and $1,247 on your gutters. Below this range and you’re spending less than 75% of other homeowners on gutters. Above this range and your gutters are 75% more expensive than other homeowners’. This data came from a sample of over 10,000 gutter projects. The average homeowner in North Carolina spends $855 on gutters, which is not a large deviation from the national average. The middle 50% was between $562 and $1,191. Once again, not a large deviation from the national average. Because of that, you can expect similar prices. The prices are for materials as well as professional installation and disposal. In the US, homeowners on average spend $328 on gutter repair. 50% of homeowners spend anywhere between $171 to $499. This means that, if you are looking for someone to repair your gutters, you have a 50% chance of spending somewhere between $171 and $499. This data can be used to determine how much your gutter repair job should cost. Gutters require yearly cleaning to keep them functioning properly. Debris can build up, block water flow, sag vinyl gutters, and reduce the efficiency of one’s gutters. Individuals who are unable to or do not want to clean their gutters usually hire a professional gutter cleaner. On average, Americans spend $144 to have their gutters cleaned. The 25th and 75th percentile was $100 to $189. This means that you have a 50% chance of paying between $100 to $189 to have your gutters cleaned. Gutters need to be cleaned every year to make sure water drains properly. The North Carolina average for gutter cleaning is close to the national average at $142. The middle 50% is between $102 and $207. Gutter cleaning prices do not change much across the nation. Vinyl – $4 to $8 per piece. Vinyl is the cheapest gutter option and the one that’s most likely to fail. Vinyl can often sag, causing spots where water pools. It can also warp and break. Some homeowners fix sagging spots by drilling holes into the vinyl. Never do this as it defeats the purpose of having gutters. Sagging gutters will need to be properly fixed. Aluminum – $6 to $12 per piece. Aluminum is more durable than vinyl but still has its problems: it can get dented. Other than that, its a very durable gutter material with a reasonable price range that’ll last a long time. Steel – $11 to $33 per piece. Steel is the heavy duty gutter material. Able to withstand hard storms, debris, and years of abuse, steel looks elegant, requires little maintenance, and will last for a long, long time. Its price point holds it back, however. Copper – $40 to $100 per piece. Copper gutters are very aesthetically pleasing. After a few years, it’ll develop a patina that looks great. It adds a lot of curb appeal to the house as well as value. Copper gutters last a very long time as well. As the most expensive gutter material, the price holds it back significantly. Seamless – seamless gutters are made on site. A seamless gutter machine guts long pieces of vinyl, aluminum, steel, or copper to make a continuous piece of gutter. The advantage with seamless gutters are that it has more structural integrity, won’t sag, and has no weak points. The price for seamless gutters range from $500 to $8,000 depending on how much’s required, the material, and complexity of the job. Heat tape, available for $77 per 100 feet, melts ice on the edge of your roof. This prevents ice damns and potential ice damage. 20 feet of gutter guard costs $6. Installation is not included in this price. Here are vital questions you need to ask a gutter company. Do they have workman’s compensation insurance? The law require that employers with 3 or more employees have workman’s comp but, for it is often unchecked, many company skimp on this. If the company does not have workman’s comp and if someone is injured on your property, you might have to pay for their injuries. Get 3-5 references. Make sure the company you’re dealing with is a reputable company. There’s no better way of finding out than asking for references. How responsive are they to your inquiries? If the company’s slow to answering your questions before you’re a customer, it’ll be hard to get them to answer your questions if something’s wrong with your gutters. Is there a guarantee or warranty? You want a company that’ll install the gutters properly. 20 years and, if maintained properly, it can last forever. Steel, aluminum, and copper gutters last longer than vinyl. Do you recommend a gutter cleaning tool? 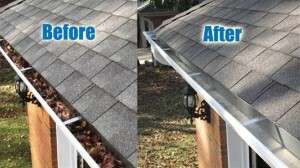 Gutter Sense is a great tool to clean your gutters, even if they are on the second story! Click here to buy Gutter Sense. 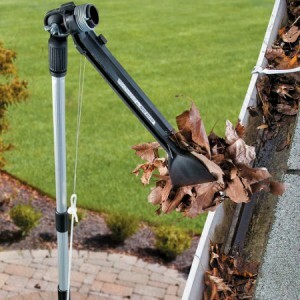 For the cost of having your gutters cleaned by a professional, you can buy a gutter cleaning tool. It’ll save you money in the long run, keep you safe on the ground, and make cleaning gutters easy. Which tool should you get though? We recommend Gutter Sense. Its a tool that needs to be attached to a telescopic pole. The benefit of that it that it’ll reach up to 2 stories. The tool has a head with tongs that you can close by manipulating the handle. This is over simplifying it but, when you use this tool, its very similar to moving salad from the salad bowl onto your plate. The only difference is that the salad bowl’s on your roof. Shop-vac attachments are usually too heavy to manipulate properly. They are also limited to 1 story homes. Nozzles for hoses are good in theory but are miserable to use in the cold fall weather. Because of that, the Gutter Sense is the best gutter cleaning tool. Its available on Amazon for $35 and a 24″ extension pole only costs $66. Its a real bargain as you’ll pay around $144 for a professional to clean your gutters one time! Click here to read the reviews.